Since 1997 Richway has offered health technologies to help people live their best lives. Richway’s brand new product, the BioAcoustic Mat™ uses sound vibrations to heal. This non-intrusive sound technology stimulates the body with deep massage and influences the body’s brainwaves to sync with the specifically-designed rhythms to boost mood and enhance the body’s own healing potential. Since 1997 Richway has offered breakthrough health technologies to help people live their best lives. Richway’s brand new product, the BioAcoustic Mat™ uses sound vibrations to heal. This non-intrusive sound technology stimulates the body with deep massage and influences the body’s brainwaves to sync with the specifically-designed rhythms to boost mood and enhance the body’s own healing potential. 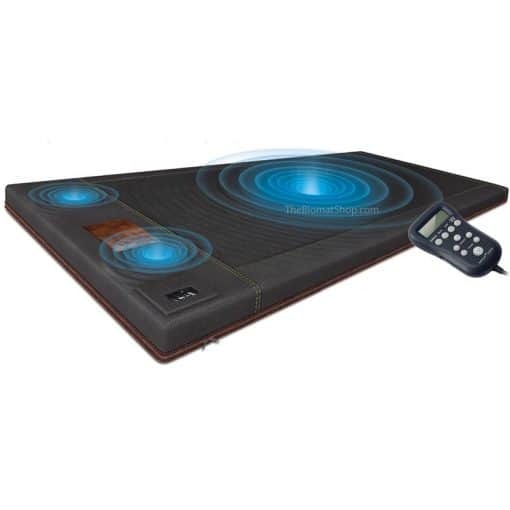 The BioAcoustic Mat™ uses three speakers to induce relaxation and reduce stress levels. The first speaker delivers a low frequency to the larger muscles. The two smaller speakers play higher frequencies that easily target smaller muscles. Twelve audio tracks were specifically designed by Dr. Lee Bartel, a leading expert in the research of vibroacoustic therapy. Songs range from digital instruments to soothing nature sounds. The BioAcoustic Mat™ can be used with the Biomat. To read more about the groundbreaking benefits of the BioAcoustic Mat™, please view our BioAcoustic Mat™ overview page. The BioAcoustic Mat™ uses three powerful speakers to send vibrations deep into your body. A single low frequency speaker in the middle for larger muscles and two smaller speakers to target smaller muscles. The BioAcoustic Mat™ comes with 12 soundtracks composed by vibroacoustic expert, Dr. Lee R. Bartel. The BioAcoustic Mat’s™ music is embedded with specific frequencies to coax your brain into different states of mind. The carefully constructed soundtracks encourage healthy neural activity. Relax or energize your body as your mind synchronizes with the rhythm. The BioAcoustic Mat™ is lightweight and easy to use. To use, simply fill with air and plug it in. The BioAcoustic Mat™ stores away quickly, just unplug and deflate. Combine the BioAcoustic Mat™ and the Biomat to maximize your experience! Using the two together will give you infrared heat, negative ions, and vibroacoustic sound. 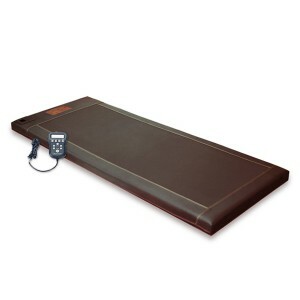 The design of the BioAcoustic Mat™ allows your Biomat to fit comfortably on top. The BioAcoustic Mat™ Professional is a perfect fit for the Biomat Professional, and make sure to pick up a BioAcoustic Mat™ Single if you own a Biomat Single. BioAcoustic Mat™ will only ship to the US and Canada.